Near where the Takano river joins the Kamo river in Kyoto sits the ancient Shimogamo shrine. The main approach to the Shinto shrine is along a wide path through the Tadasu no Mori (the ‘Forest Where Lies are Revealed,’ or the ‘Forest of Correction,’ depending on who you ask). 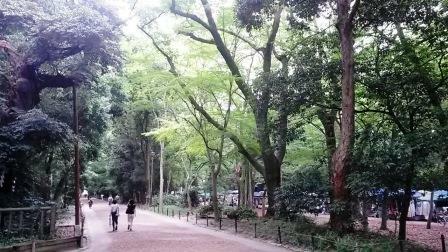 This woodland of broad leaf trees is, apparently, quite rare in modern Japan. Some of the trees are up to 600 years old. 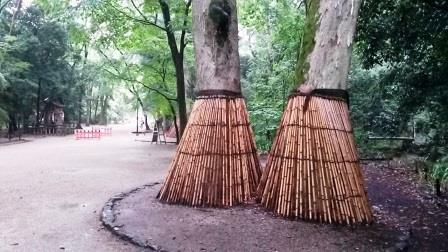 And a few of these trees have bamboo skirts. Investigations into precisely why some of these ancient trees wear skirts revealed little. It seems the bamboo skirts are providing some kind of protection to the trunk of the tree: one local thought that it may be protection from disease. I saw only three trees under bamboo, but I did not fully explore the 12 hectares of national historical site listed forest. The shrine and the forest are of such renown that you will find items such as jigsaw puzzles, mugs, books and prints celebrating them on Amazon . The only other instances of bamboo skirts on trees that I found online were academic studies detailing experiments to prevent Nipah virus infection in local populations who harvest and consume date palm sap. 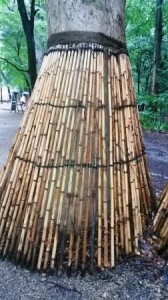 The bamboo skirts act as a barrier to fruit bats, also fond of the sap, that transmit Nipah virus by contaminating the raw sap with their saliva. Bamboo skirts aside, the Shimogamo-jinja and Tadasu no Mori is a lovely place to visit should you find yourself in Kyoto . One of my visits coincided with a market day. 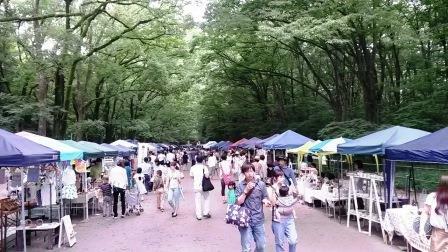 Numerous local craft stalls at the market had attracted quite a crowd. And still, the place was quiet and subdued. Lovely. 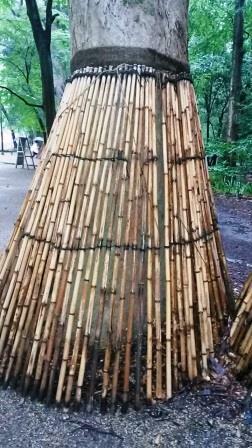 This entry was posted in All, Bamboo around the world, Bamboo in the garden and tagged bamboo, Japan, Shimogamo, tadasu no mori on 18/08/2014 by Deb.